Our guide to Minneapolis will help you find the best kid friendly parks in Minneapolis Minnesota. Drawing comparisons between Minneapolis and St. Paul is a difficult task. St. Paul has a slightly reserved, antique feel about it; Minneapolis is hipper, noisier, and busier. Both cities have tall, gleaming glass skylines; St. Paul's is designed to blend with the city's art deco and Victorian architecture, while Minneapolis's is more eclectic. St. Paul has preserved much of its architectural heritage, while most of downtown Minneapolis is new. Both cities straddle the Mississippi River, and riverboat traffic calls at the Twin Cities from as far away as New Orleans. There are tons of great kid friendly parks in the city of Minneapolis, our city guide will help you find the best kid friendly parks. You may have a hard time deciding what to do in Minneapolis, but we make your decision easy. 11265 53rd Ave N - Timber Shores has a small play structure, picnic shelter, playing field, and - on Bass Lake - a fishing pier and boat launch. 1339 Theodore Wirth Pkwy - This sprawling park is the largest administered by the Minneapolis Park Board, and is part of the scenic Grand Rounds. 15205 County Rd-6 - Plymouth's Parkers Lake Park features a beach, canoe rental, fishing, and concessions in summer, and in wintern, ice skating and a warming house. 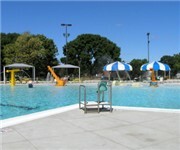 3110 Xylon Ave S, (952) 935-1395 - Aquila Park is a kid friendly park located in Minneapolis MN. 3998 Bryant Ave S, 64663768255410 - Lyndale Farmstead Park is a kid friendly park located in Minneapolis MN. 420 Main St SE, (651) 855-2835 - Father Hennepin Bluffs Park is a kid friendly park located in Minneapolis MN. 620 W 34th St, 64663768255408 - Pointer Park is a kid friendly park located in Minneapolis MN. 6328 Portland Ave, (612) 861-9355 - Veterans Memorial Park is a kid friendly park located in Minneapolis MN. 4800 Grand Ave S, (612) 370-4963 - Size doesn't matter in the case of this diminutive park, which packs a boatload of activities and offerings into a half-block site. 9000 Portland Ave S, (952) 563-4634 - Valley View Playfields offer accessible playground equipment; tennis, volleyball and basketball courts; a skate park; and many ball fields. There are plenty more kid friendly parks in Minneapolis. See all kid friendly parks in Minneapolis Minnesota.